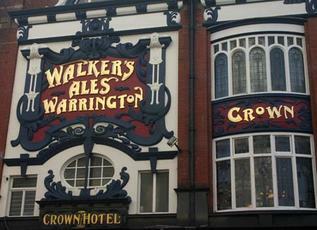 Started a mini-crawl of Liverpool heritage pubs here on Sunday lunchtime. Untouristy crowd, good banter, cheap sandwiches, too many beers and the Pride was very average (NBSS 2.5), but worth a visit to see the interior and enjoy the atmosphere. 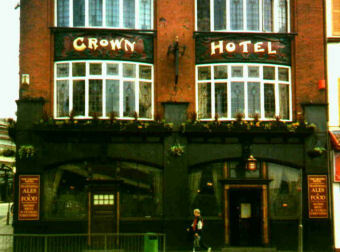 The Crown is still a really handy pub for the station. But because of that, it always seems to be busy. 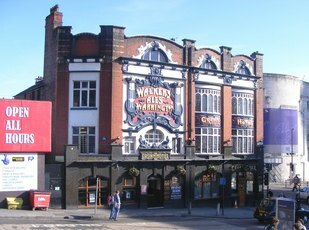 It's one of the few buildings on this side of Lime Street to have survived the bulldozers. The interior is nice and there are generally 8 ales on, mostly national brands. Yesterday, they had Jennings Cumberland Ale, Black Sheep Best Bitter, Greene King Abbot & IPA, Orkney Dark Island, Sharps Doom Bar, Timothy Taylor Landlord & Everards Sly Fox. Spectacular Art Nouveau exterior and relatively intact interior (but not quite in the same league as the Philharmonic ) . Reasonable range of ales but food was crap - my chicken jalfrezi was overcooked and microscopic. Choice and quality of ales has improved quite significantly though this pub will always be busy whatever they served. 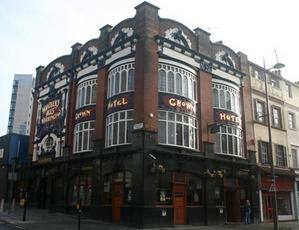 It is now by far the best bet for ale for anyone wanting somewhere close to Lime Street station.